Michael J. "Mike" Barker is a partner at Quintairos, Prieto, Wood & Boyer, P.A. and heads up the firm’s Business, Financial Services & Real Estate Division. He is a Jacksonville native and represents clients throughout Florida and beyond. Mr. Barker represents clients engaged in the default servicing, banking, mortgage lending and mortgage servicing, construction and development, and title insurance industries in both transactional and litigation matters. 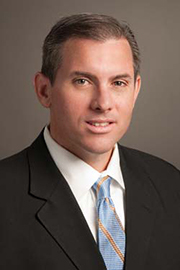 Primarily, his practice focuses on residential and commercial foreclosures, asset recovery, REO real estate transactions and title insurance, title insurance claims, construction disputes, evictions, creditors' rights in bankruptcy, documentation of leases, loans and secured transactions, evictions, and collection matters. Prior to joining QPWB, Mr. Barker was founding shareholder of Barker & Barker, P.A. and Barker Land Title & Escrow, Inc. Mr. Barker is licensed to practice law in Florida and a member of The Florida Bar. He is admitted in the U.S. District Court for the Northern District of Florida, U.S. District Court for the Middle District of Florida, and U.S. District Court for the Southern District of Florida as well as the United States Bankruptcy Court for the Northern, Middle, and Southern Districts of Florida. Mr. Barker is a Board Certified Specialists as recognized by The Florida Bar Board of Legal Specialization and Education and has served as a member of The Florida Bar Construction Law Committee, Real Property Probate and Trust Law Section. Additionally, Mr. Barker is a member of NAIOP, the Commercial Real Estate Development Association and Mortgage Bankers Association (MBA). Mr. Barker received his Juris Doctor from Loyola University New Orleans College of Law in 1999 and his B.A. from the University of Florida in 1996. Mr. Barker has attained an AV® Peer Review Rating from Martindale-Hubbell, the highest rating for ethics and legal ability.